By the 2-minute warning in the fourth quarter, legions of Los Angeles Rams fans were making their exodus from the Coliseum. This reaction was a vast contrast to previous home games, where most of the crowd stayed until the regulated clock stopped. The Rams lost their early lead and could not get it back. Running back Todd Gurley and kicker Greg Zuerlein kept the Rams competitive, but a touchdown pass caught by Buffalo Bills wide receiver Marquise Goodwin late in the fourth quarter sealed their fate. 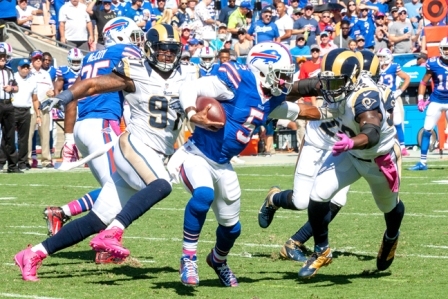 The Bills thwarted the Rams’ three-game winning streak in a 30-19 bout. Bills wide receiver LeSean McCoy rushed the ball for 150 yards, Gurley rushed for 72 yards and earned three receptions for 36 yards. Rams wide receiver Kenny Britt got five catches for 75 yards. Bills tight end Charles Clay made five catches for 73 yards. Mark Barron led the Rams defense with eight tackles, Buffalo linebacker Preston Brown made six tackles for Buffalo. Gurley added another historic achievement to his resume by earning the first in-season touchdown since the Rams' return to Los Angeles. Zuerlein picked up the slack for the Rams offense, executing four field goals. His most impressive kick came in the third quarter from the Bills 36 yard line, completing a 54-yard field goal. Los Angeles did not have defenders Michael Brockers, Robert Quinn, and William Hayes to stop McCoy’s agility. Four Bills players made an impact in the Coliseum in the past as USC Trojans. Among them was wide receiver Robert Woods, a Carson native who attended Serra high School in Gardena. In 2009, the Serra Cavaliers football team went on a 15-0 overall record with the help of Woods. The Cavaliers also won the Division III state championships. He played for USC from 2010 to 2012, coming in sixth in school history with 2,930 receiving yards. Cornerback Nickell Robey-Coleman earned an interception and converted it to a touchdown in the stadium of his alma mater. The Bill’s defense kept the Rams from scoring more than one touchdown.